Sarah and I had discussed whether to spend the last night in Rome. Fortunately that plan was abandoned because of the lack of accommodation available and the sky-high prices. Two popes were to be canonised. The journey into Rome proved quicker and easier than imagined. 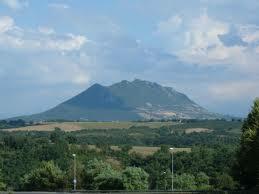 Monte Soratte, the rocky outcrop towering over the Tiber valley north of Rome, did, as a bus driver once point out to me, resemble Mussolini’s profile. A priest once told me that hermits in the early centuries of Christianity had thrown themselves off the highest point, not far from the early Christian church with Latin words scrolled above the pillars. I remember how disappointed I was that he couldn’t translate them for me, as I only had the limited knowledge of ‘O’ level Latin. ‘I can’t,’ he said,’ it’s medieval Latin’. Surely his studies should have… I digress. We were set down near a flight of steps that led up to the entrance to the Vatican Museums, seething with groups and the usual long queue. Sarah had a special entry permit for us; so had all the other groups, it seemed. While sorting this out, there were scuffles and insults. When we were allowed in through the security, the entrance lobby was seething too. Miraculously Sarah didn’t lose anyone as she led us though the masses to one point, then another as she was given conflicting information about where to meet our guide for the Vatican gardens. Release at last! It was sunny. We joined a competent if uninspired guide already with others in tow, and started our tour. 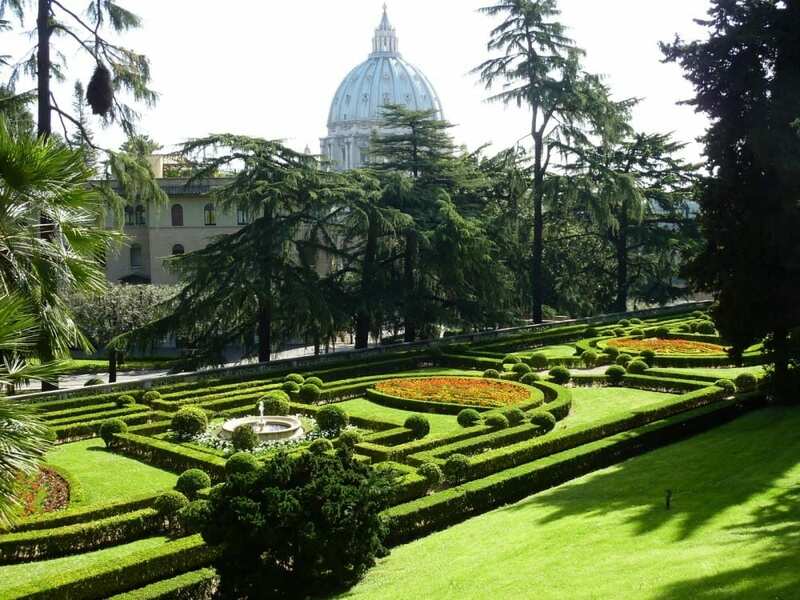 I had been told the Vatican gardens were nothing special, but John and I wanted to enthuse about the exquisite little Mannerist pavilion by Pirro Ligorio in the mid 1500s, full of visual jokes and invention and painted sparkling white – but a conference was being held there! There were shrines sent or paid for by communities from different parts of the world and trees planted by various recent popes, a stupendous fountain and many other less memorable ones. I was intrigued by a wall with wisteria and crimson and white valerian growing out from it at right angles. It’s a plant I have always invited to invade my garden at a normal angle, and never succeeded. The highlight was a superb view of Michelangelo’s dome for S. Peter’s. And the calm. Back to the lobby and seething humanity; up the moving stairs to the top and more waiting while our museum guide returned from her previous tour. 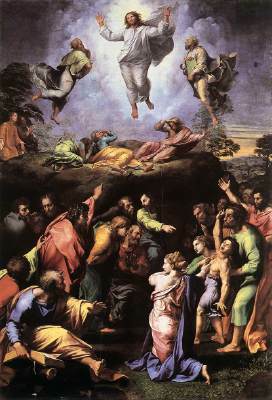 In the quieter Pinacoteca we looked at key paintings that Vasari divided into three periods, and above all Raphael’s Transfiguration that he completed just before he died. It was movingly set between two earlier paintings and in the same room as one of the tapestries in cloth of gold that he had designed for the lowest part of the Sistine Chapel. They used to be hung for an enclave, but no more. The gold woven into the fabric glistens but makes then heavy and fragile. The cartoons are in the Victoria and Albert Museum. Then on to Caravaggio and a surprising painting by Sir Thomas Lawrence of George IV – a diplomatic gift. The Etruscan galleries are often unexpectedly closed, as was the Pinacoteca last summer when we wanted to visit it. We were the only visitors. Bliss it was to see the superb works from the Etruscan sites we had visited – Cerveteri in particular. The craftsmanship in gold jewellery, breastplates and the bronze figures, not to mention the larger terracotta statues gave much delight – a visual feast to savour. It was interesting to see the artefacts from other contemporary Mediterranean civilisations that had been entombed with Etruscan artefacts, a taste of the interlacing trading cultures that plied the waters of this inland sea. Some would say it was the umbilical cord of the earliest human civilisations.